Following the success of the inaugural Western Alzheimers Pub Pint Race at the October Galway Races, the charity race is back for the summer festival. Looking for something a little different? Got bar tender skills to show off? Perhaps you spotted the inaugural Pint Race screened on At The Races and shown on Sky Sports News in October and were wondering how can the pub get involved. 1 The pub/hotel fundraises for Western Alzheimers. 2 The pub decides on a representative who competes against a number of pub contenders in a race, which involves running a distance with a pint on a tray - the person who finishes fastest and with the most drink left in the glass wins. 3 The winning pub receives a specially commissioned sculpture to display in its premises for the duration it holds the Publican’s Pint Race winning title. The current title holder is Darcy’s Bar in Eyre Square. There is also a group prize for the team that raises the most money. It will take place on Saturday August 4 at the Galway Races from 1pm but be quick, as there are only a few places left. With the ever-increasing demand for its services Western Alzheimers is partnering with Claregalway & District Day Care to open a new purpose-built day care centre in Claregalway. The new facility will be a day care centre catering for 25 people, five days per week. A bus service will be provided on varying days to different areas of County Galway to ensure easy access. Ten of these places will be for service users who have a dementia diagnosis and the specialist care will be provided by Western Alzheimers. If you are interested in participating claim a place in the race by contacting [email protected] or calling 086 3494720. 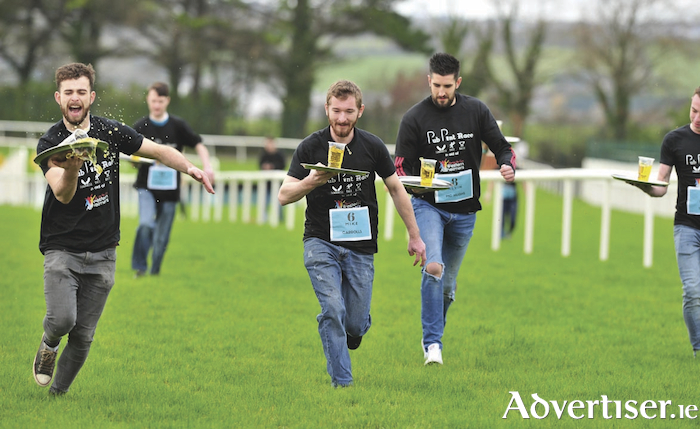 Check out the last year’s race on https://westernalzheimer.ie/2017/11/14/pub-pint-race-review/.